Are Women Dancers Still Discriminated Against? I co-wrote the article below forty years ago. Since the issue has come up again (actually it never went away) I decided to post it. This diatribe was useful back in 2000 when a group of choreographers called the Gender Project got together to address discrimination against women in dance. Reading this article from 1976, they were appalled at how familiar it sounded. Although I basically stand by what we said and the data we gathered, I now feel some distance from the strident tone. During the ’80s and ’90s, AIDS devastated the dance community. So many of my male colleagues were dying that I dropped all my anger about how hard it was for women to get a gig. At least we were alive. We were dancing, we were having babies. I’ve written about this change of heart in my book, Through the Eyes of a Dancer. Back in the 1970s, Stephanie Woodard and I were collaborating on choreographic projects, and our rehearsal-break conversations led to a desire to expose the discrimination against women. Because we were both teaching at Trinity College in Hartford, we had ample opportunity to observe the difference in male and female student behavior. (At that time there were only two genders, nothing in between.) Stephanie, a dance ethnologist, knew about ballet history, so all the references to Taglioni et al are hers. Sorry for the lousy reproduction of the chart here; it’s from a xerox of a xerox. The chart is based on data we gathered, but I can’t vouch for the sources, because I just don’t remember. Reading this over so many years later, I don’t completely agree with all our statements. So, in the manner of Yvonne Rainer’s “A Manifesto Reconsidered,” I am inserting my current reactions and updates in double brackets. Dancers and critics alike are proud of the ever-increasing numbers of men in dance because their presence has legitimized it. No art is recognized as an art until men do it, from cooking to medicine to dance. And then it becomes dignified, arduous, skilled. 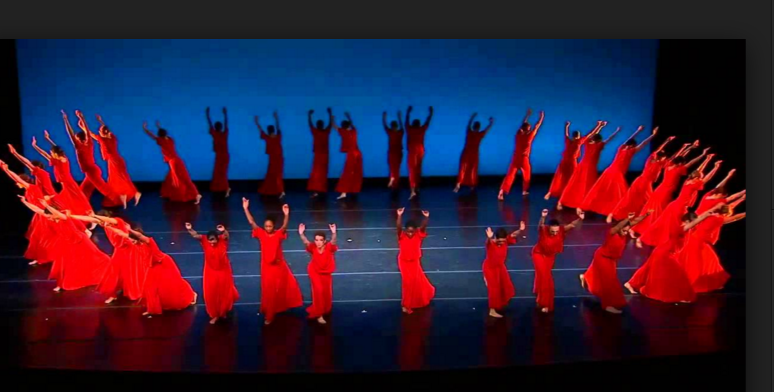 From an artistic point of view, American modern dance is the achievement of women. Isadora Duncan and Loie Fuller discovered it, Martha Graham and Doris Humphrey explored it, and the excitement of it unfolds today through women like Trisha Brown and Twyla Tharp. Over the years women have pushed back the boundaries of dance, extending the movement vocabulary, creating new modes of performance, revolutionizing concepts of composition. Ballet has allowed women as well as men to hold influential positions as performers and choreographers. It is popular today to show disdain for ballet in the nineteenth century, when women were its focus. Contemporary critics are impatient with the contrived plots and the affected acting and are embarrassed to think that male dancers had only secondary roles and were called “porteurs” or “carriers.” Walter Terry, renowned ballet critic, lectured at Harvard Summer School Dance Center last year [[I was teaching there that summer]], extolling the ascendancy of men in dance—to a lukewarm student audience of a hundred women and eight men. However, the technique of ballet, with its feather-light leaps, its long balances, its mercurial changes of quality from one kind of step to another, was developed by women largely to appear ethereal. Of course, it was sexism—ranging from a desire to idealize women as fairies and nymphs to a desire to watch women’s bodies—which allowed the ballerinas center stage. But once there, women, with their more pliant bodies, gave ballet its fleet, supple style. Today an increasing dance audience goes hand in hand with increasing commercial success for men. Male dancers are getting hired and male choreographers are getting grants way out of proportion to their numbers. In the chart that accompanies this article, we compiled data on 1,900 students, scholarship students, and company members of six major New York City modern dance and ballet companies with affiliated schools (almost all asked not to be named). In addition we obtained data on 316 grants given by the National Endowment for the Arts (1974–1975) and the New York State Council on the Arts (1971–1974). We included only companies that depend on the choreographic influence of a single man or a woman, for example, the New York City Ballet or Dan Wagoner and Dancers. Grants to companies that featured several choreographers, e.g., American Ballet Theatre, or collaborative choreography, e.g., Grand Union, were omitted. 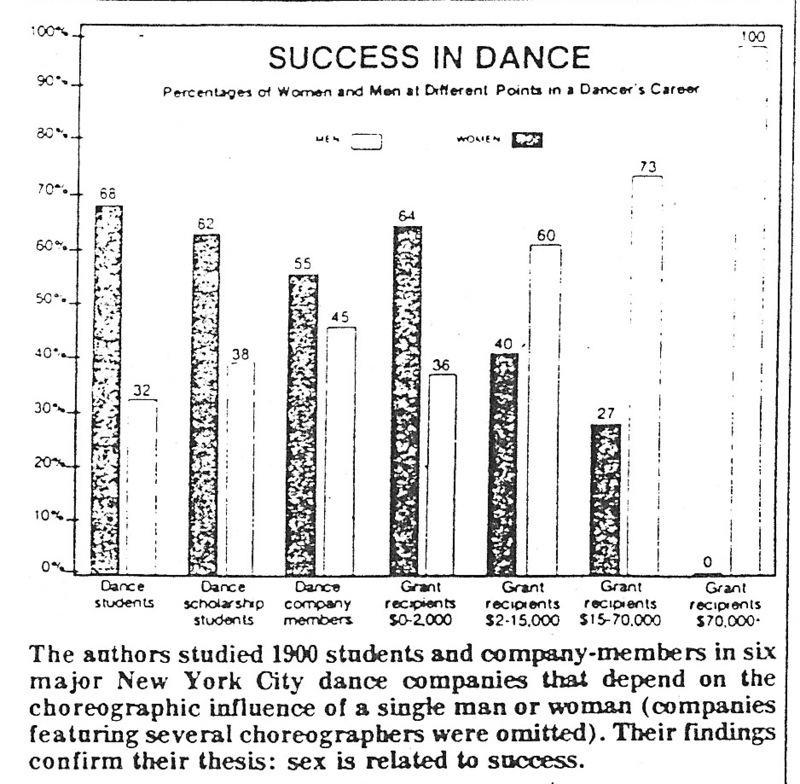 The resulting data show a clear relationship between gender and success in dance. Behind these figures lies a wealth of stories, like that of the dancer who counted only two women choreographers out of the fifteen he had worked with during his four years with the Joffrey Ballet. Or the woman who could run down a list of auditions where she’d been good enough but not man enough for the job. We interviewed fifteen young professional dancers and choreographers to find out how this situation affects their careers, what happens when a man or a woman tries to get a performing or teaching job, how men and women are treated in class, whether there are separate standards for men and women, and whether both women and men contribute to the problem. Because of the sensitive nature of their disclosures, the interviews quoted below are pseudonymous. The growing number of men has increased competition among them somewhat. An administrator in the school of one of New York’s leading ballet companies said, “Four years ago we would have given a scholarship to any boy who walked in the door.” He went on to say that nowadays they could be more selective, but were nevertheless still supporting boys with less training than their female scholarship students. Despite this no one can deny that men have more opportunities. “Don,” a talented and vibrant modern dancer, admitted, “I couldn’t be where I am professionally if I weren’t a man.” He started dancing three years ago at the suggestion of a dramatic coach. With a little army discipline behind him and a natural ease of movement, he was asked to dance professionally after eight months. He quickly saw that there was more room for him in dance than in theatre. Much attention came his way in dance classes and although he knew the reason was simply a dearth of men, he made the most of it. “I get offered a lot of jobs,” he says. “I always take the one I can learn the most from.” He is fed up with women saying, “Oh, you’re a man, that’s different,” because he feels he chose his goal wisely and worked to make it happen. Men are becoming a top attraction because they sell at the box office and they sell on stage. The Martha Graham Dance Company, whose repertoire traditionally features female protagonists, has begun to take in male dancers who have never even studied the technique. This is quite a change from the days when the Graham technique was sacred and a dancer was profane until she or he had spent years getting it under the belt. And if a man sells, an undiluted flock of them sells better. 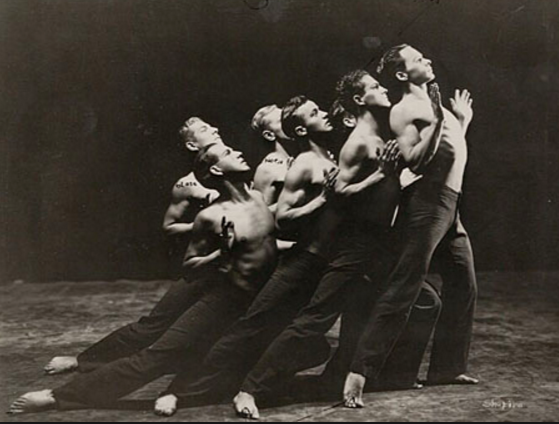 The American prototype is Ted Shawn’s muscular, spectacular all-male company of the 1930s. Today’s counterpart is Pilobolus, a group of gymnasts whose debut in 1972 as an all-male dance company was greeted with near-hysterical acclaim. We have both taught beginning dance classes. Time and time again, we’ve seen that, in a new and possibly intimidating situation, men will be generally more aggressive, physically and personally. As a dance teacher, you see the whole problem embodied before your eyes. What women dancers have been able to do all along is to be spectacular and subtle at the same time. The exquisite feats that audiences marvel at are accomplished not by strength alone, but with sensitivity and skill. From Camargo to Taglioni to Cynthia Gregory, and from Duncan to the best of our contemporary dancers—Sara Rudner [[who is still a terrific dancer]], Jennifer Muller [[she no longer dances but her company has been going since 1974]], Carolyn Lord [[a ballet dancer turned downtown choreographer who now runs the Construction Company space]]—women have achieved a formidable mastery of the art and a range any performer would aspire to. Photo of Martha Graham on homepage by Imogen Cunningham. I think that dance borrows this hyper sexualization of the body from our broader culture. If you reveal the body not covered with cloth, it means that you are making it available to others in a sexual way (we conflate sensual and sexual completely) and even the act of expressing yourself with the entire body sends a cultural message that your make that body available beyond expressing yourself in writing or verbally. This deep seated pathway/perspective is embedded in our educational and socialization processes and with so few people even taking dance as education, they are left only to pick up signals from the culture that may or may not have any reality based in the actual act of dancing.